The United States Interagency Council on Homelessness (USICH) is an independent federal agency within the U.S. executive branch that leads the implementation of the federal strategic plan to prevent and end homelessness. USICH is advised by a Council, which includes the heads of its 20 federal member agencies. The immediate past chair was Department of Health and Human Services Secretary Sylvia Mathews Burwell, and the vice chair was Secretary of Education John King. USICH partners with these 19 federal agencies, state and local governments, advocates, service providers, and people experiencing homelessness to achieve the goals outlined in the first federal strategic plan to prevent and end homelessness, Opening Doors. Coordinate the federal response to homelessness and to create a national partnership at every level of government and with the private sector to reduce and end homelessness in the nation while maximizing the effectiveness of the Federal Government in contributing to the end of homelessness. USICH is made up of a small team headquartered in Washington, DC, led by Executive Director Matthew Doherty. Policy staff work closely with each of the 20 Federal Agencies that make up the Council to make progress on the goals and strategies of Opening Doors. USICH works directly with states and communities through five Regional Coordinators who connect with state and local governments in the creation of strategic plans and to promote the strategies of Opening Doors in local communities. Provide professional and technical assistance to states, local governments, and other public and private nonprofit organizations. To finish the job of ending chronic homelessness by 2015. To prevent and end homelessness among Veterans by 2015. To prevent and end homelessness for families, youth, and children by 2020. To set a path to ending all types of homelessness. 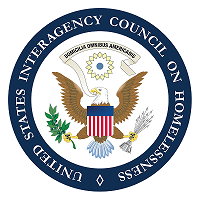 The Interagency Council on the Homeless was authorized by Title II of the landmark Stewart B. McKinney Homeless Assistance Act enacted on July 22, 1987 (PL 100-77). The McKinney Act established the Interagency Council on the Homeless as an "independent establishment" within the executive branch to review the effectiveness of federal activities and programs to assist people experiencing homelessness, promote better coordination among agency programs, and inform state and local governments and public and private sector organizations about the availability of federal homeless assistance. In 2002, Council members voted to approve changing the name of the agency to the United States Interagency Council on Homelessness (USICH), a change that was enacted into law in 2004 (PL 108-199). The most recent reauthorization of USICH occurred in 2009 with enactment of the Homeless Emergency Assistance and Rapid Transition to Housing (HEARTH) Act. (PL111-22). The Council originally included the heads (or their representatives) of 16 Federal agencies. Five additional agencies were subsequently added by Council vote or statutory amendments, while two agencies are now inactive. The current members of the Council include the heads of the following 19 Departments and agencies: U.S. Departments of Agriculture, Commerce, Defense, Education, Energy, Health and Human Services, Homeland Security, Housing and Urban Development, Interior, Justice, Labor, Transportation, and Veterans Affairs, Corporation for National and Community Service, General Services Administration, Office of Management and Budget, Social Security Administration, United States Postal Service, and the White House Office of Faith-based and Community Initiatives. It is estimated that 550,000 women and men are without shelter each night in the United States. Mandated by Congress under the Homeless Emergency Assistance and Rapid Transition to Housing (HEARTH) Act of 2009, USICH was tasked to create a national strategic plan to end homelessness which will be updated periodically to reflect progress and changing priorities. As a result, Opening Doors was drafted and serves as the nation's first comprehensive national strategy for ending homelessness. This strategic plan, entitled Opening Doors: Federal Strategic Plan to Prevent and End Homelessness, was presented on June 22, 2010 to President Obama's staff and members of Congress. The plan was created to help strengthen existing programs geared towards addressing the issues of homelessness and works to create partnerships with not only existing programs, but forge new ones in the effort to help the nation. The strategy also presents cost-effective strategies for states, local and the federal government. "Opening Doors" serves as a roadmap for joint action by the 19 federal agencies of USICH, along with state and local partners in both the private and public sectors. In the process of developing this comprehensive plan, USICH held stakeholder meetings, work group meetings to focus on statistics of the population pertaining to this issue, held expert panels, and sought public comment through an online website. Objective 1: Provide and promote collaborative leadership at all levels of government and across all sectors to inspire and energize Americans to commit to preventing and ending homelessness. Objective 2: Strengthen the capacity of public and private organizations by increasing knowledge about collaboration, homelessness, and successful interventions to prevent and end homelessness. Objective 3: Provide affordable housing to people experiencing or most at risk of homelessness. Objective 4: Provide permanent supportive housing to prevent and end chronic homelessness. Objective 5: Increase meaningful and sustainable employment for people experiencing or most at risk of homelessness. Objective 6: Improve access to mainstream programs and services to reduce people's financial vulnerability to homelessness. Objective 7: Integrate primary and behavioral health care services with homeless assistance programs and housing to reduce people's vulnerability to and the impacts of homelessness. Objective 8: Advance health and housing stability for youth aging out of systems such as foster care and juvenile justice. Objective 9: Advance health and housing stability for people experiencing homelessness who have frequent contact with hospitals and criminal justice. Objective 10: Transform homeless services to crisis response systems that prevent homelessness and rapidly return people who experience homelessness. (1) The Secretary of Agriculture, or the designee of the Secretary. (2) The Secretary of Commerce, or the designee of the Secretary. (3) The Secretary of Defense, or the designee of the Secretary. (4) The Secretary of Education, or the designee of the Secretary. (5) The Secretary of Energy, or the designee of the Secretary. (6) The Secretary of Health and Human Services, or the designee of the Secretary. (7) The Secretary of Housing and Urban Development, or the designee of the Secretary. (8) The Secretary of the Interior, or the designee of the Secretary. (9) The Secretary of Labor, or the designee of the Secretary. (10) The Secretary of Transportation, or the designee of the Secretary. (11) The Secretary of Veterans Affairs, or the designee of the Secretary. (12) The Chief Executive Officer of the Corporation for National and Community Service, or the designee of the Chief Executive Officer. (13) The Administrator of the Federal Emergency Management Agency, or the designee of the Administrator. (14) The Administrator of General Services, or the designee of the Administrator. (15) The Postmaster General of the United States, or the designee of the Postmaster General. (16) The Commissioner of Social Security, or the designee of the Commissioner. (17) The Attorney General of the United States, or the designee of the Attorney General. (18) The Director of the Office of Management and Budget, or the designee of the Director. (19) The Director of the Office of Faith-Based and Community Initiatives, or the designee of the Director. (20) The Director of USA FreedomCorps, or the designee of the Director. (21-?) The heads of such other Federal agencies as the Council considers appropriate, or their designees. ^ "42 U.S. Code § 11312 - Membership". September 17, 2018.